Crossing over from summer to fall is never all that exciting in LA. As should be expected I guess. In fact, it leaves me a bit more confused with each passing year and this year is truly no different. I liken our seasons to a relationship that lacks in clear communication. Just when I should be expecting warm foliage painting our windows gold as I look from within, I need to embrace the fact it's just the way it is in So Cal. I can merely hope to savor a gust of wind in the month of September and August. A breeze that evokes all the senses depicting fall, like the smell of dry crunchy leaves underneath my feet, the crisp air suggesting I carry a coat everywhere I go, and Starbucks bringing back their spiced lattes. But of course, my gateway of choice to experiencing genuine fall is through the countless bowls of warm farro, tidbits of amazing milestones, and breathtaking photography people are posting nowadays. It's funny that my taste buds are also altered and confused to a certain degree. Though I can never say no to sashimi of any kind regardless of the season, I've committed the one thing I always considered to be a foodie crime. In my mind it was never ever okay to mix raw fish, or poke in this case to be exact, with greens other than romaine, scallion, and seaweed. But I did it. I went ahead and mutilated a perfectly delicious slab of salmon by adding stuff to it. I recalled Urth's kale salad and how delightfully tangy it was, and it dawned on me that massaged kale would actually enhance the creamy texture and buttery flavor of raw salmon. So after turning to Cynthia's unbelievably adorable parfaitinis for inspiration, everything came together in a pinch. This salad is truly the best of all worlds. It seemed best to keep it as close to Asian as possible, but I opted for a bold mixture featuring sweet shoyu and wasabi to make the flavors come alive. In my experience, most pokes I've tried were rather plain and left me reaching for something extra. I knew I needed to make this dish more distinguishable for those who love sweet and tangy. Not only is it exploding with different flavors and textures, but it is extremely nutrient dense, making it the ideal comfort food this fall for those who are health conscious. We will be heading to Kansas this week so fingers crossed we'll catch a glimpse of red foliage! Have a wonderful week, friends! Blend all the ingredients together except for the kale. Mix into the chopped kale and massage thoroughly until it's well seasoned. Set aside and rinse out the blender for your next step. Blend all the sauce ingredients except for the salmon and sesame seeds. ***To thaw sushi or sashimi grade fish, I've heard it's best to place it in a tightly sealed ziploc bag with all the air sucked out. Then place it in a bowl filled with lukewarm water and continue this process until fish is mostly thawed but still cold. *** Now onto the poke! Simply cube the salmon into equal pieces and coat it in the sauce and sprinkle with sesame seeds. 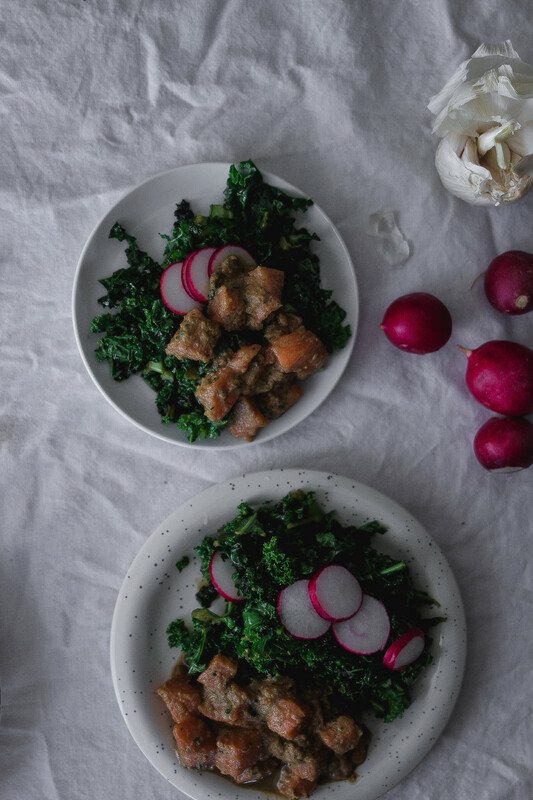 Serve with kale salad and say hello to a healthy fall.